Dive Log is designed to work either as your primary SCUBA diving logbook application or in conjunction with compatible 3rd party desktop logbook applications. You can use Dive Log at the dive site or on the dive boat to capture the information about the site while it is fresh in your mind (or your dive guide's mind). 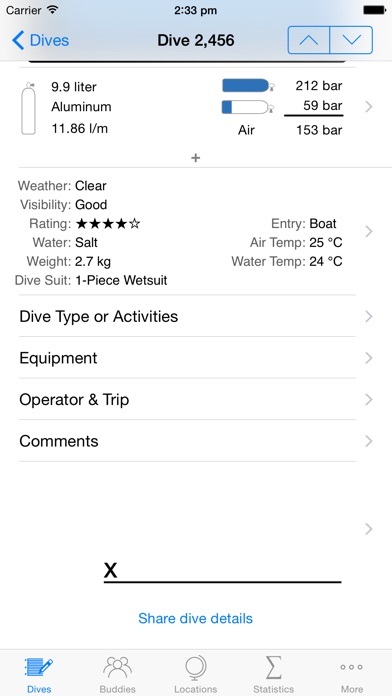 You can even capture the GPS coordinates of the dive site using the built in location services of your iOS device. Details about your actual dive can be added immediately after your dive or at the après dive event and later be saved to your desktop computer. The dive buddy feature is fully integrated with Contacts on your iPhone or iPad, letting you capture information about your newest dive buddy or quickly add an existing buddy to a particular dive. The dive data and statistics features let you have an immediate answer the next time your dive guide asks how much weight you used on your last dive or have all the information you need about your dive history when you fill out that next dive waiver. Metric and Imperial values are supported for all appropriate logbook fields. You can easily enter values using the appropriate units for the situation and view them in your preferred measurement system. 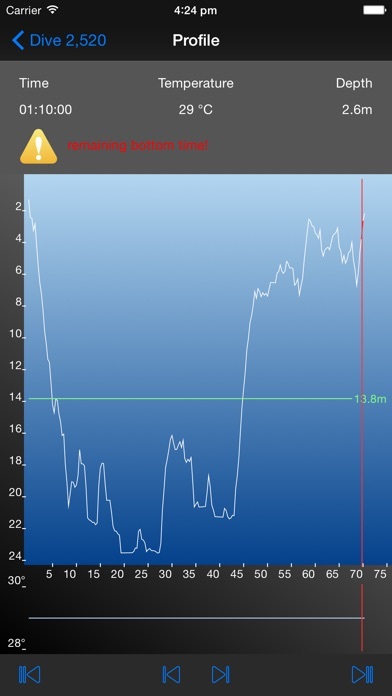 You can even explore detailed dive profiles from popular dive computers that you download with your desktop software and later upload to Dive Log on iPhone/iPad. Dive profile data can also be transferred directly from certain dive computers directly via Bluetooth or using a supported Bluetooth accessory and an associated in-app purchase. On Windows, Diving Log 6.0 (www.divinglog.de) is fully integrated with Dive Log on iPhone/iPad and has built in synchronization. Diving Log 6.0 has extensive support for importing data from dive computers and other dive log applications. On Mac OS X, logbook information can be imported to Dive Log on iPhone/iPad from a number of compatible applications using the free Dive Log Manager application available from More Mobile Software (www.moremobilesoftware.com/divelog-sync). Dive Log DT (available on the Mac App Store) can be used to directly import a number of dive computers and file formats and can synchronize with Dive Log on iOS. Dive Computer Buddy (aka DCbuddy) is a Bluetooth LE accessory by DiveNav Inc. and available for purchase separately (www.divenav.com/products/dcbuddy). 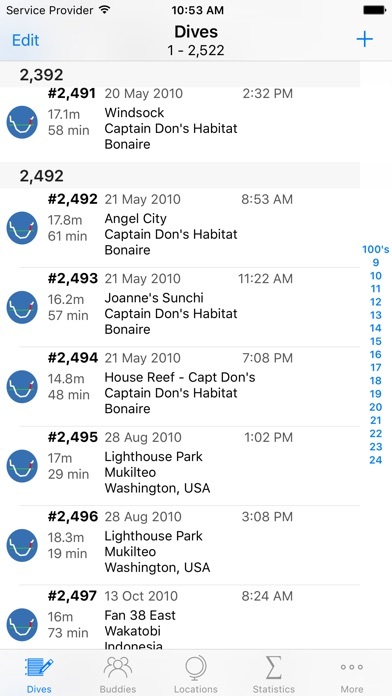 The DCbuddy allows you transfer dive data from certain dive computers (including models from Suunto, Oceanic, Aeris, Sherwood and Mares) directly to Dive Log on your Bluetooth LE (Bluetooth 4.0) compatible iPhone, iPad or iPod touch. 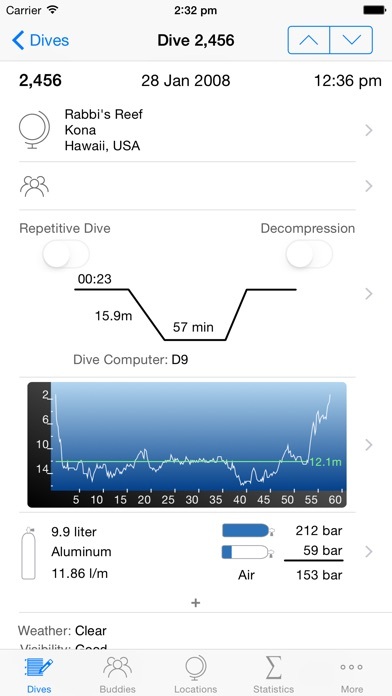 Dive data can also be directly downloaded on a Bluetooth LE (Bluetooth 4.0) compatible iPhone, iPad or iPod touch from Bluetooth LE capable dive computers such as the Suunto EON Steel, Suunto EON Core, Suunto D5, Scubapro Galileo 2 (G2), Aladin Sport (Matrix), Aladin H (Matrix) Shearwater Teric, Petrel 2, Perdix, Perdix AI, NERD 2, Oceanic VTX, Aeris A300CS, Aqualung i300C, i750TC, i770R, Mares Genius and certain heinrichs weikamp OSTC computers as well as the DiveNav Inc. bluebuddy and Tech Buddy dive logger accessories. Supported Bluetooth LE accessories are available separately. Mares Bluelink Pro is a Bluetooth LE accessory by Mares and available for purchase separately (www.mares.com). The Bluelink Pro allows you transfer dive data from certain Mares dive computers (Puck Pro, Smart, Smart Air, Quad and Quad Air) directly to Dive Log on your Bluetooth LE (Bluetooth 4.0) compatible iPhone, iPad or iPod touch. • Support for newer Aqualung i770R firmware. • Expanded list of dive computers supported by the Suunto Bluetooth Download in-app purchase to include the Suunto D5. - an initial set of tank templates for various common US/DOT and EN/ISO tank sizes. - ability to edit the existing template tanks, create new templates, delete templates and reorder the template list. - choosing a template tank that will be used for all newly created tanks (for example when creating a new dive, adding a tank to a dive, importing a dive from a dive computer or a file format). - applying template tanks to already existing tanks with undo/redo support (shake device to activate on iPhone or iPad, or use the new tank menu button on iPad). • Support for specifying any previous dive as a template when downloading new dives from a dive computer. • Support for appending two dives (for example if you surfaced for too long during a dive and the dive computer recorded two dives). To use this feature you will long press on the first dive in the Dives tab to bring up the contextual menu. The contextual menu will only be presented if the selected dive and the following dive meet the criteria to be joined. • Added support for searching available Equipment and Marine Life items when adding them to a dive. • Added support for viewing an Equipment item’s details from within a dive. • Added a new Dives by Max Depth section on the Statistics tab. • Expanded list of dive computers supported by the Mares Bluetooth Download in-app purchase to include the Mares Genius. • Expanded list of dive computers supported by the DCbuddy in-app purchase to include the Tusa Zen IQ-900 and Zen Air IQ-950. • Minor bug fixes and corrections.